Northrop Frye as David Gilmour! Courtesy of Bob Denham, this is the inside back cover of the Chinese translation of The Secular Scripture. 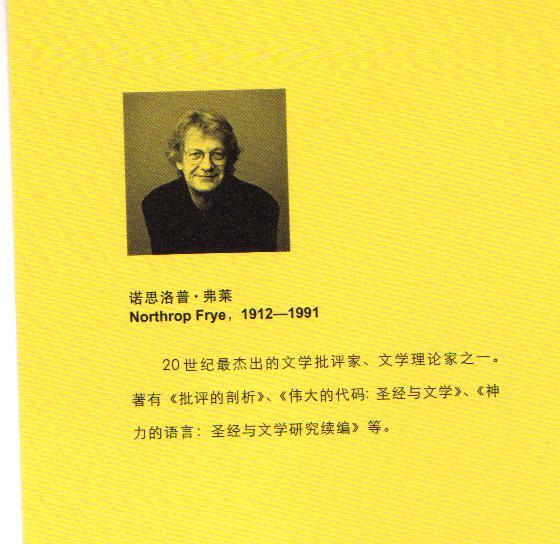 While it’s wonderful that Frye’s masterpiece on Romance is now available in Chinese, that is not, of course, Frye pictured above. It is Canadian writer and critic David Gilmour. I hope Gilmour gets to see this. It’s about as flattering a case of mistaken identity as anyone could hope for. This entry was posted in News, Secular Scripture on November 3, 2010 by Michael Happy. The Republicans elected a lot of candidates tonight who — judging by the behavior of their compatriots — will be eager to collect the graft that will shortly be coming their way from big oil and Wall Street. But not the one above, who represents everything that is wrong with the Palin brand of Republicanism, and, happily, went down to defeat in her bid to become the junior Senator from Delaware. The Republicans are nihilists at this point. They stand for nothing but gaining and holding onto power while comforting the comfortable and afflicting the afflicted. They’re not even republicans in any meaningful sense. They are plutocrats who make it clear by their actions that their vision of America is heartless predation affirmed by the Constitution. Let’s see how far that gets them. This entry was posted in Current Events on November 3, 2010 by Michael Happy.